My mom lost her sweet Golden Retriever Pinkerton last week. I loved that dog so much and of course, she was devastated. So, sadly, I made her a sympathy card. 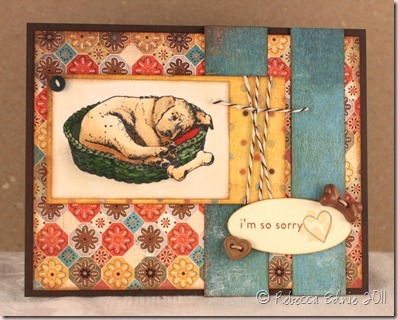 Inside is one of the sentiments from the PTI animal sympathy set. I actually don’t remember which one. The paw is from that set too and the heart is from Tiny Treats: Valentine. The sketch is May’s SFYTT. Oh my, I'm so sorry for your loss. Your card is touching, and I'm sure you mom appreciated it. Sending hugs!